This photograph was taken on January 9, 2000 at the retirement ceremony for Maj Gen Edward Richardson. The ceremony was on the 154th Wing flightline and included a parade of Hawaii Army and Air National Guard personnel. Many Guard retirees attend the ceremony. 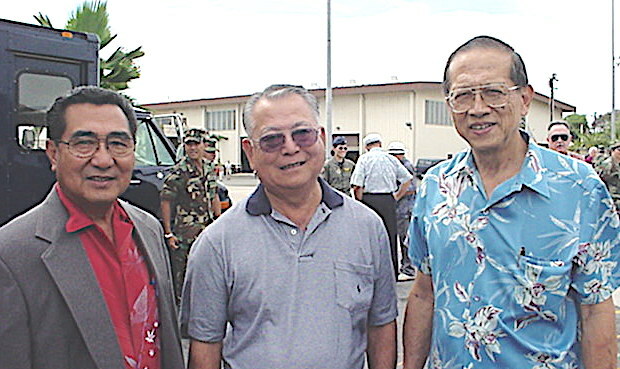 In the photograph are three colonels: Dr. Norberto Baysa, former commander of the medical unit; Col Ernest Shima, former commander of the 201st Combat Communications Group, and Dr. Walter Chang, former commander of the medical unit. All three were Traditional Guardmembers who served for many years before they retired.